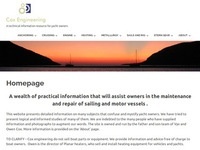 A site containing much information on the technical side of yachting, with hundreds of photographs illustrating designs and arrangements, both common and unusual. 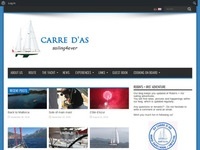 This is the cruising blog of David & Lindsay Inwood, full time live-aboards (ie sold up to go sailing), initially in our Najad 391 "Red Panda" and then in our Contest 48CS "Goldcrest". It covers our voyages from 2009 onwards, starting as real rookies sailing into the Med, a couple of years getting to Turkey & back to the UK, changing boats for ocean passages & crossing the Atlantic to the caribbean. There our plans changed and we spent a year or so doing most of the US east coast, a tiny bit of Cuba &Mexico before heading back to Europe. We had an eventful east-bound Atlantic crossing and are now back in the Med. We are Ian and Lorraine Cuthbertson from Canvey Island, Essex, UK. We decided many years ago that we wanted to go off and discover other parts of the world. So after many years of planning we set off on 8th May 2017. On our first leg we intend to take in France, northern Spain, Portugal and end up somewhere in southern Spain by October/November. We created the website so that we could keep a record of where we've been, what we've been up to and also so that friends and family could follow us on our journey. 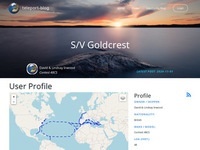 This blog is our photographic and written record of our dream adventure to explore the world on our sailing yacht, Blue Velvet of Sark. We both left work early and set off from the UK in 2013, not really sure if our gamble would work. Would we be able to afford to live this dream lifestyle? Would reality live up to the dream expectations? Would we be constantly plagued by boat breakages ... the cruising is "yacht maintenance in exotic places" analogy? We don't know the answer to all of those questions yet but the blog tracks our progress and the fun we are having along the way finding out. The summer cruises of Whileaway a Westerly Oceanquest sailed by Andrea and Richard. 2014 – the Channel Islands, Brittany and the Biscay coast of France. 2015 – the north east coast of France, Belgium and the standing mast routes through the Netherlands. 2016 – from Amsterdam, through Friesland, the German Frisian Islands and the Kiel Canal to the Baltic Sea. Then exploring south and west Denmark, the east coast of Sweden and the north coast of Germany. 2017 – Along the north coast of Germany to Rugen, across to Bornholm, the south east coast of Sweden to Karlskrona, returning to Ystadt, then Danish islands of Ven through Smalandsfarvandet, Sonderborg, and finally Schleswig and on to Fehmarnin Germany. 2018 - Plans are to head further up the east coast of Sweden. 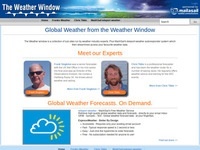 My site is primarily about how to obtain, understand and use marine weather forecasts. I hope that it will help sailors to get a better understanding about weather on all scales of time and space..
We are Iris and Robin fro Switzerland and decided to sail the seven seas, bought a boat, equipped it and started in Sicily, on to Greece, Turkey, back to Greece, on to Italy, Malta, Tunisia, Italy Greece and Italy again. Plan is to slowly go west and cross the pond in 2018 - plans tend to change when sailing - will see! The blog is in English and German and just talks about our travel and our experiences. 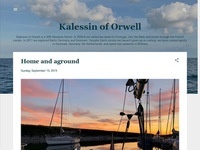 Kalessin of Orwell is a 33ft Westerly Storm sailed by Sam and Camilla and their two sons, Guy and Ben. In 2006-8 we sailed her down to Portugal, into the Med, and home through the French canals. In 2011 we explored Baltic Germany and Denmark. 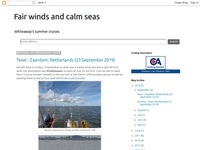 Despite Sam's stroke we haven't given up on sailing: we cruised gently in Denmark and Germany in summer 2013, and Kalessin is now cruising in home waters on the UK East Coast, Belgium, and the Netherlands. This site is a guide to sailing in the Baltic. It covers the travels of Kissen, a Hallberg-Rassy 36, which has spent the last 5 years or so slowly crawling round the flesh-pots, sorry, beautiful locations of the Baltic Sea. Kissen has now been based in the Baltic for 8 years. We only went for a couple! It was only last year (2010) that we can finally say that we have managed to visit every country in the Baltic at least once. 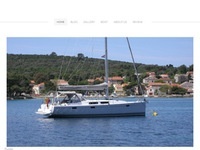 Jan and Mark Cullen's blog about sailing in the Adriatic on their Hanse 415 Lyra. Focus on destinations, food and history.